Tyeb Mehta had a fondness for the beautifully grotesque. 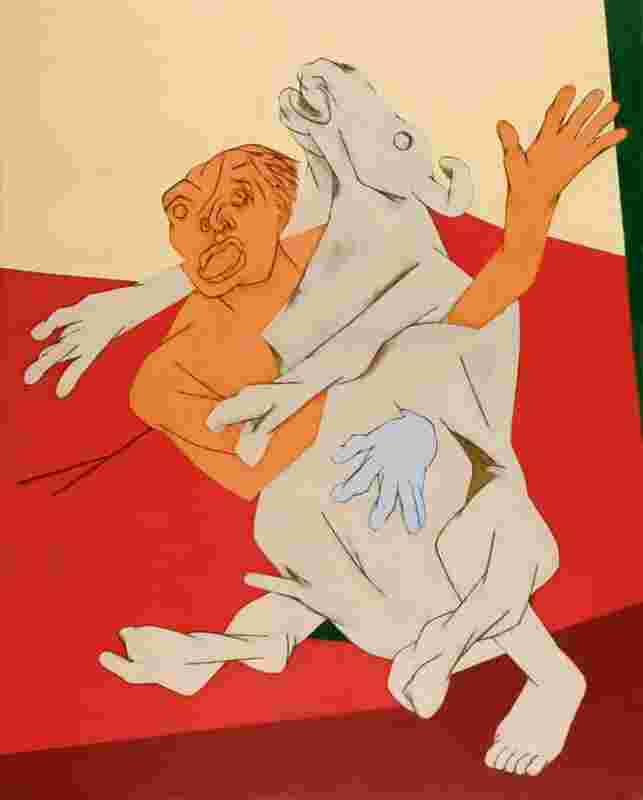 Sometimes compared to the British artist Francis Bacon, the towering figure of Indian modern art, who died in 2009, often rendered Hindu mythical figures in a way that could be repulsive and simultaneously captivating. His goddesses look demonical and the demons, endearing. In the 1980s, he was drawn towards Devi, the female divinity. 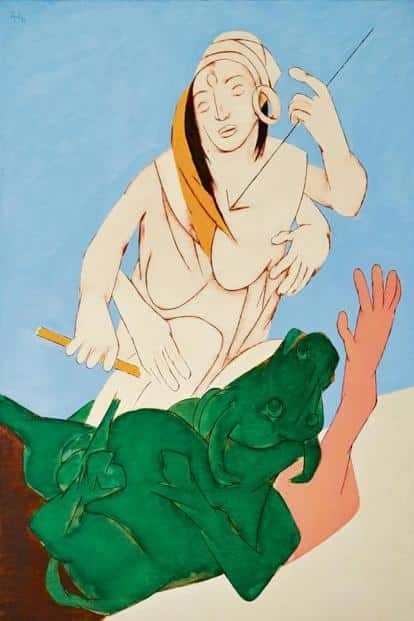 And the 1990s saw him moving towards painting more feisty depictions as Durga, shown slaying the demon Mahishasura. Come December, the centrepiece at Sotheby’s inaugural Indian auction in Mumbai will be Durga Mahishasura Mardini, painted in 1993, as Mint reported on 11 April. Mehta painted the subject multiple times, sometimes within a single year: in 1993, 1994, 1995, 1996, 1997, 1998, 2001. It was also, it seems, his lucky charm. The 1994 work fetched $1.2 million in 2009; a 1996 version went for $1.1 million in 2007; another 1996 version sold for $2.2 million in 2012. The idea of good versus evil has a long pedigree in ancient Indian iconography, where Durga is often seen slaying the Mahishasura, “the Buffalo Demon", who can change form. But Mehta sidestepped the rich visual vocabulary of tradition and kept just the barest of lines and bright colour planes to suggest either form. The story that Mehta grew so fond of exists in different versions. One comes from Devi Mahatmya, part of the larger ancient Hindu text Markandeya Purana. In short, Mahishasura, an all-round nuisance for the devatas (gods), was threatening cosmic stability. He had a boon from Brahma that he couldn’t be killed by any man, demon or beast. Brahma had made no mention of women and Mahishasura therefore ultimately meets his end at the hands of the goddess Durga. Only Mehta doesn’t quite make it as clear in his works. 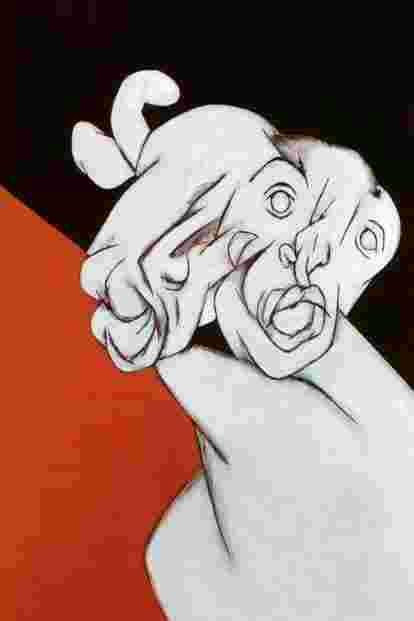 To begin with, he conjoins and contorts the two figures, with a nod to Cubism, so you don’t know where Durga begins and where Mahishasura ends. Are they really fighting? The figures on the canvas could even be up to something—carnally, so say the theorists. Then, many of Mehta’s main subjects are painted along a diagonal axis. In a 2009 tribute to the artist, the art critic Girish Shahane noted, “The diagonal is more dynamic than the vertical or horizontal...thus creating a sense of movement." He goes on to surmise that the diagonal might have been inspired by Mehta’s memory of Partition, a trauma he survived as a Muslim artist who stayed back in Mumbai. Mehta leaves a lot of room for questions. The composition is cinematic, almost as if he is painting jump cuts, unsettling the gaze. In his early career, he did dabble in film-making and editing, even winning a Filmfare Critics Award for an experimental film, Koodal, in 1970. Mehta revels in ambiguity. The myth may be about good versus evil, but Mehta gives viewers a choice to see flickers of harmony in seeming chaos. Tyeb Mehta’s intentions—much like his demons—remained, until the end, shape-shifting.